Catherine knows personally about the power of healing words and uplifting thoughts. Like all of us, she has had her share of difficult times, but throughout each challenge she knew that faith was the first step, and after that, "God would do the rest." 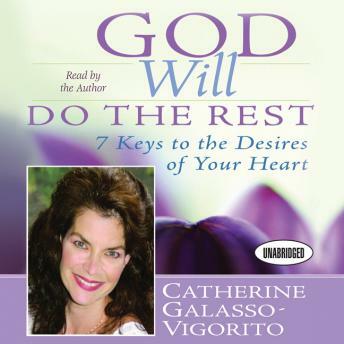 Now, Catherine brings every listener the opportunity to achieve his or her heart's desires. Because every desire of the heart is created by God, we can achieve it only by discovering the seven keys to His kingdom. Catherine's voice-reassuring and compassionate-is joined by those of her listeners who share their experiences of reaching out to God...and finding him. Whether it's a naval submarine officer looking for faith to continue and not give up, a single mother seeking help to put her daughter through college, or a person struggling to deal with a devastating illness, each story will touch the listener's heart and reveal a key to His kingdom. Every key brings us closer to making our hearts' desires a reality. All we need do is use them to open the first door, then the second, and when all are opened, stand back and watch in gratitude. For God really will do the rest!